The weekend of January 25 to January 27, I attended the Days of the Dead Atlanta horror convention at the Sheraton Atlanta Hotel in Atlanta, GA, splitting a table with fellow dark fiction author T.S. Dann. I sold 24 copies of The Thing in the Woods and six copies of The Best of Heroic Fantasy Quarterly Vol. 2 . After running all of my expenses (costs of the table, per-unit book costs, snacks, a Lyft ride) and gross revenue, I made around $180 profit. In terms of single-event profitability, this one places second to the Atlanta Comic-Con in July 2017 and ahead of the Atlanta Sci-Fi and Fantasy Expo I attended in March 2017. This one is a definite go-back, especially once my upcoming horror-comedy Little People, Big Guns is released by Deadite Press in November 2019. In addition to earning money, I also got 31 e-mails for my mailing list, which will come in handy when my military sci-fi novel Blood on the Border, the slightly more science-fiction oriented Thing sequel The Atlanta Incursion, and LPBG come out. *Always split the table at a convention if you can. One reason that I made so much profit (as opposed to just gross revenue, although that too was pretty high) at Atlanta Comic-Con was because I split the table with C.S. Johnson. The table cost at Days of the Dead was high, but fortunately Dann was able to shoulder half of it. If he hadn't been able to attend, I would have barely recovered my expenses--and that doesn't take it into account that some people who came over to check his stuff out ultimately bought some of my stuff instead or as well. *Take the time to network. I met Jeff Strand and his wife as well as John Wayne Comunale there. The Strands informed me there's a Horror Writers Association chapter that just formed in Atlanta that, in addition to networking opportunities at meetings, intends to set up a table members can sell from at the Decatur Book Festival. Considering how I sold a fair number of copies at the DBF at the Atlanta Writers' Club booth, another table someone else is paying for that I can put shifts in sounds awesome. *Have more than one product to sell if possible. 20% of my profit for the event came from the Heroic Fantasy Quarterly anthology, which wasn't yet published when I had my first book signings and convention appearances. As I publish more and more books, I anticipate my revenues will rise. Someone who isn't interested in the Lovecraft-type horror of Thing might like the Dungeons and Dragons and/or Conan the Barbarian type stories in the Heroic Fantasy Quarterly anthology or the ridiculousness and Crosses The Line Twice of LPBG. *Always bring your lunch. Leaving the table to get food will not only cost you potential sales (since you're not at the table to sell to passers-by), but you'll spend money on the food. Getting a sandwich from the hotel Starbucks at the Atlanta Comic Convention in December 2017 cost me $6.50, equivalent to the profit of selling one copy of The Best of Fantasy Quarterly Vol. 2 . I'm not recommending being a total cheapskate, especially if there's something new and good to eat at the convention, but remember everything has a cost. *Always have lots of bookmarks and other swag to hand out. I handed out hundreds of VistaPrint large-size cards (that can be used as bookmarks) that Digital Fiction Publishing designed for me. This cards have a QR Code linking to a page with links to the various places my fiction is available online. People who weren't able to purchase my books at the convention will be able to do so using the QR code on the card--and be able to purchase other short stories, novellas, etc. that simply don't exist in print form. Even if they don't know how to use QR codes or simply don't bother with them, the card has the title, author, publisher, etc. and can remind them to look it up. Handing out the cards could generate additional sales for me for days, possibly weeks, afterward. 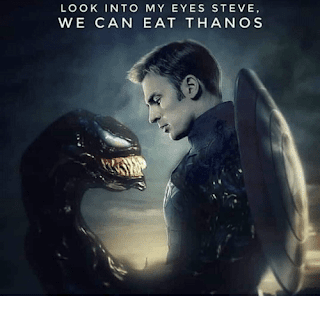 Not sure who created the meme or else I'd give credit (the link I got it from is click-baity and full of ads, so I'd rather not send you there), but "look into my eyes" is based on a line from the movie Venom . I can't find a good clip of it online, but it's one of the lines quoted here. In the meantime, I participated in a discussion of the movie Labyrinth for the film podcast Myopia: Defend Your Childhood, a movie that I also reviewed independently. During the episode, the character Hoggle is justifiably criticized for betraying protagonist Sarah (Jennifer Connelly), but in his defense, Hoggle is acting under orders from Jareth the Goblin King (David Bowie). If he helps Sarah and her brother Toby (Toby Froud) escape, he's still going to be living in the Labyrinth and there's going to hell to pay. However, as you might expect from a kids' movie, Hoggle has a change of heart and assists Sarah, who ultimately reclaims her abducted brother from the Goblin King. 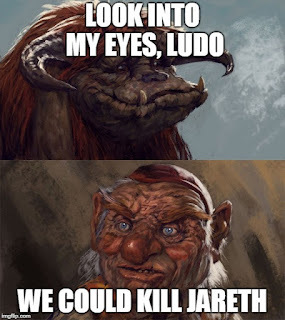 That solves her problem, but doesn't solve Hoggle's--and those of Sarah's other allies, Ludo's and Sir Didymus's--problem of being known rebels against Jareth. If Jareth reasserts his power, he's going to punish them for rebelling against him and assisting the mortal girl (and her little brother) he was messing with. Key word: If. Jareth's goblin armies are scattered and he's uniquely vulnerable. It's either him or them. 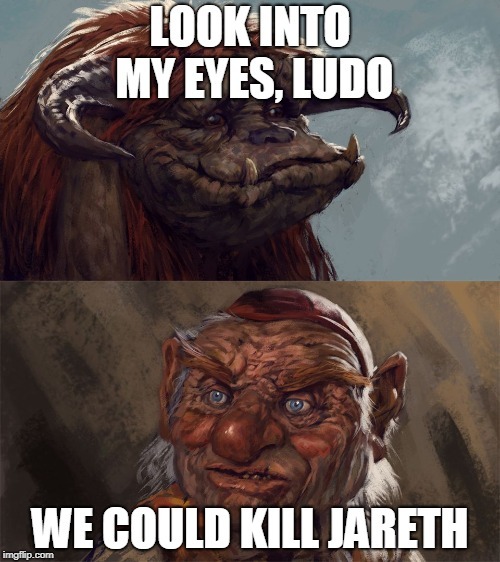 Although Jareth seems to have Reality Warper abilities, Ludo has shown himself capable of geological magic on a large scale and Hoggle is a sneaky little man. The film ends with Sarah and her Muppet friends having a dance party in her room, so clearly Jareth is no longer in a position to have Ludo, Hoggle, Sir Didymus, etc. imprisoned or killed. As was noted in the podcast, some of the Muppets are creatures who were enemies not long before (goblin soldiers) or independent hostiles (the Fireys), but nobody seems to care. Perhaps with Jareth gone, all is forgiven, much like what happened with most of the Axis rank-and-file troops after WWII. I've taken a page from fellow blogger and writer Matt Stienberg and decided to post about what I accomplished in 2018 and what I intend to do during 2019. *I sold my bizarro comedy-horror novella Little People, Big Guns, which is slated for publication sometime in 2019. I owe the success for this one to my father Terry Quinn, who through a client learned that the 2015 World Horror Convention in Atlanta needed volunteers, and Anya Martin, who actually arranged for me to become a volunteer. Volunteering gained me access to a pitch session, where I pitched the concept to Jeff Burk, who thought it was hilarious. Once I expanded and revised the novella, I sent it to Mr. Burk when Deadite Press re-opened to submissions and voila! *I learned more deeply the importance of conventions and what the most profitable ones would be. I sold an entire print run of thirty copies of The Thing in the Woods at the Atlanta Sci-Fi and Fantasy Expo in March for a little over $155 profit, in July profited nearly $400 thanks to splitting a table at The Atlanta Comic-Con with C.S. Johnson, and made roughly $100 profit splitting a table at the quarterly Atlanta Comic Convention in December with Robert Jeffrey. In contrast, I straight-up lost money on a fall festival in Snellville, the emerging authors' tent at the Decatur Book Festival, and a twofer book signing and small-town comic-con in Augusta, GA and Bishopville, SC respectively over the summer and made only a nominal profit on a gun show in May. *Speaking of The Atlanta Incursion, I finished that and submitted it at the end of September. Hopefully that'll be accepted and published sometime in 2019. I can't speak for the publisher, but he did seem interested and I'm one of his more aggressive sellers. *I started writing Blood on the Border, the first work of fiction set in my Federated Worlds universe. This is a project I intend to go full independent on, and it'll hopefully open the door to making lots of money at more explicitly science-fiction conventions like Treklanta and SphinxCon. *Make a killing (heh) at the Atlanta Days of the Dead, which I will be attending with T.S. Dann at the end of January. I still have between 60 and 100 copies of Thing and a few copies of The Best of Heroic Fantasy Quarterly Vol. 2 and this is a horror-focused event, so this has the potential to be extremely lucrative. *Finish Blood, run it through writing group, and get paperback editions available for Treklanta and SphinxCon. Assuming SphinxCon is the same time as it was last year (early November) that won't be a problem, but Treklanta is Memorial Day Weekend. That could be the tricky part. Treklanta might not be as lucrative as I'm hoping because FW is intended to be a critique of Star Trek in some ways--rather than "we don't have money in the 24th Century," it's an automated economy where most people don't need to work and one species' equivalent to Surak is more like Josef Stalin than Jesus Christ--but SphinxCon is a general military SF/fantasy convention. *Continue with the comic conventions. The Atlanta Comic Convention is quarterly, while the big Atlanta Comic-Con is slated to return as well. I've done pretty well at these and once I have a greater variety of products to sell, I anticipate things will be even better. Having a table partner is particularly important, especially for the pricey conventions like Atlanta Comic-Con and Days of the Dead. *The Decatur Book Festival has many other options besides the emerging-author tent, such as the Atlanta Writers' Club booth. I'll definitely sign up for a slot there with the AWC again. *Assuming TAI is accepted and published sometime this year, I will begin working more intensely on the third book, The Walking Worm, which is more akin to the small-town Southern horror of Thing as opposed to the MIB/UFO stuff that TAI introduces. To make an X-Files analogy, TWW is more "monster of the week" while TAI introduces an overarching mythos. Not sure if I can get that manuscript done and submitted in 2019 given how I don't even have a full outline, but if I can keep my focus anything's possible. *Battle for the Wastelands has been under consideration by a major publisher for some time, but they don't want it, it's time to self-publish. I have a prequel novella "Son of Grendel" centered on the villain's son already written and a prequel novella "Ruled in Rage" focused on the villain himself as a youth partially written. If I finish "Rage" I could put out Battle first and on the 90 and 180 day mark after that put out a novella. I don't have a lot of the second Wastelands book Escape written yet, which could be a problem.